Love hoppy beer? 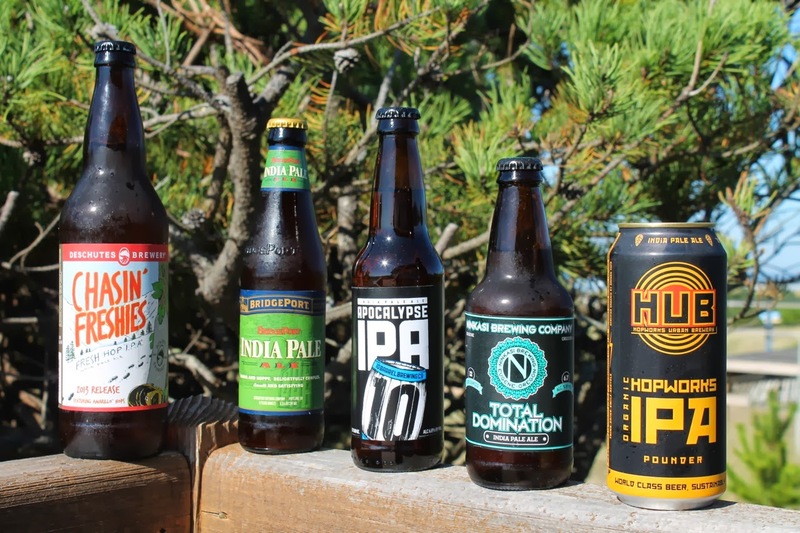 You really need to visit Oregon and try beers like these. Washington Post: “Valentine’s Day tributes to the Food and appliances we love,” the Food section staff. The whole gang gets into the act on this one: essays about their favorite food and kitchen appliances. I’m with Jim Webster (“there is nothing — nothing — I want for dinner more than a huge bowl of pasta”). Loved Jane Touzalin’s story about the only argument she ever won with her father because she could identify butter over margarine. And Bonnie Benwick’s commercial refrigerator is sure to stir jealousy in any home cook who ever brought home too much food to fit in the fridge. Washington Post: “Hops: The beer ingredient (most) drinkers love,” by Greg Kitsock. I’ll admit it, I’m a hophead. I love my beer with the biggest, bitterest hop kiss possible. Chris does too. I’ll bring home those craft beers with pictures of hops on the labels and he’ll declare them not hoppy enough. Kitsock looks at the rise in popularity of the little green cones in flavoring beer, which weren’t always the prize attraction they are today. Closet Cooking: “Beef Wellington Tarts with Mushroom Blue Cheese Sauce,” by Kevin Lynch. Beef Wellington is a Christmas tradition in our house, but I didn’t make it this year because I wanted to try something different. Shame this Closet Cooking recipe for a deconstructed version hadn’t come along, or I’d have definitely made it. This looks amazing. I love that he incorporated greens into the dish. Lynch offers this as a possible Valentine’s Day dinner for two. Sounds perfect. Thrillist: “A Field Guide to Regional BBQ Styles in America,” by Adam Lapetina. This is the best region-by-region explanation of the different types of barbecue, complete with signature dishes and examples of prime purveyors. I’d never heard of Alabama barbecue before (or the mayonnaise-based sauce popular in that iteration). Makes my mouth water just reading this. New York Times: “If It’s Chili, It’s Personal,” by Jennifer Steinhauer. Who doesn’t love chili? I made a whole week’s worth of chili recipes last year. Here, Steinhauer provides a good 101 on the subject, complete with recipes. New York Times: “Why Can’t You Find That Wine?,” by Eric Asimov. Asimov looks at why it’s hard to find certain wines—it has to do with distribution being different in every state—and offers helpful suggestions for those dedicated to finding a certain bottle, like Wine-Searcher. Wall Street Journal: “Melted Cheese's Delicious Secret,” by Sarah Nassauer. Cheese is great. But melted cheese is really something special. This distinction isn’t lost on foodmakers. Nassauer looks at the allure of melted cheese and efforts to capture it. NPR: “Thank You, Shirley Temple, For The Original 'Mocktail',” by Eliza Barclay. Child star Shirley Temple Black passed away this week. Barclay has a nice tribute to the actress and her namesake mocktail, which she didn’t invent but was apparently protective of. What can I say? Hops make me happy. Also: I look forward to Beef Wellington's return to our Christmas table!